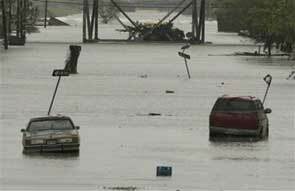 Hurricane Rita’s steady rains sent water pouring through breaches in a patched levee Friday, cascading into one of the city’s lowest-lying neighborhoods in a devastating repeat of New Orleans’ flooding nightmare. Posted on September 23, 2005 Author KallistiCategories UncategorizedTags News & Politics. Yawn!